UPDATE 7:45PM: Ok, here’s the link to the site that is displaying this page: http://213.4.104.210/showtime/live/index.html. 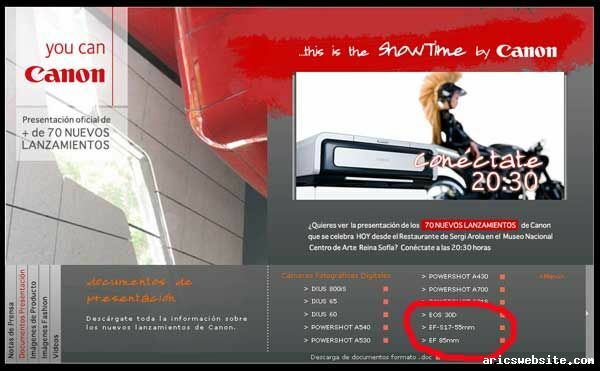 Click on the 2nd “tab” from the left (Documentos Presentacion). Then click “Cameras Photograficas Digitales”. 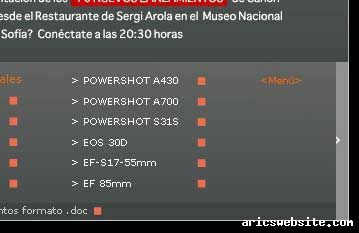 This link was originally posted on the Canon.es (Spain) website. It was removed after being publicized on various photography forums. In case you’re wondering, the WHOIS look up shows the IP is registered to Telefonica Data Espana. Well, I use the term “official” loosely.. if you believe that this screen shot is from an official Canon press website, then yes, this is official. Canon will be releasing the Canon 30D (not 35D as believed earlier) to replace the Canon 20D. What’s also interesting is the introduction of an EF-S 17-55mm lens. I (as well as some on dpreview) believe that this will be a replacement for the current “kit lens”, the EF-S 18-55mm. I doubt the EF-S 17-55mm is supposed to compete against the likes of the EF 17-40L or EF-S 17-85mm. Here is the screen shot. I had to shrink it a bit to fit it in my blog space, but below it, I’ve posted a crop of the interesting part..
Based on my earlier post from yesterday, it sounds like the Canon 30D is going to be the official successor to the Canon 20D. Also, this and the picture from yesterday lend more credibility to the “cell phone” picture I posted earlier. The leak didnt provide info on the number of megapixels. However, I still believe its a safe bet to assume its going to be in the 10 megapixel range. Additionally, the leak said that the Canon 5D price will be lowered (or that a cheaper full-frame 5D-like camera will be released later) to basically sandwich the Nikon D200. I guess the Canon 30D will be cheaper than the Nikon D200 with the Canon 5D being slightly more expensive, but offering a full-frame sensor versus Nikon’s 1.5x sensor. UPDATE 02/21/06: Canon introduces the new Canon 30D to succeed the Canon 20D.. read more here! Previous Post Canon 30D? Not 35D?